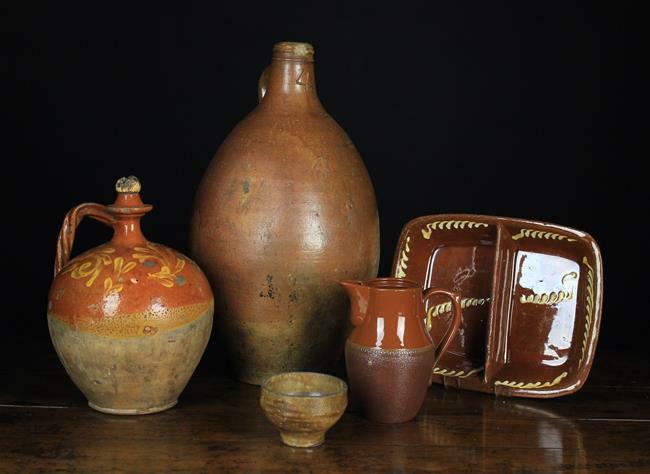 A Large 18th Century Salt-glazed Stoneware Flagon, 19 in (48 cm) high, a 19th century French earthen-ware flagon; the semi-glazed body decorated in yellow slip with sprays of foliage and having a rope twist handle, 11½ is (29 cm) in height. A Langley Mills 1½ pint jug. A terracotta slip-ware dish with centre divide. And a small gazed earthenware bowl. A Group of Kitchen Pottery: A pair of French early 20th century relief-moulded Majolica game dishes marked Mehun France; the lids surmounted by the head of a hare & a pheasant 5½ in (14 cm) high, 9 in x 5½ in (23 cm x 14 cm). 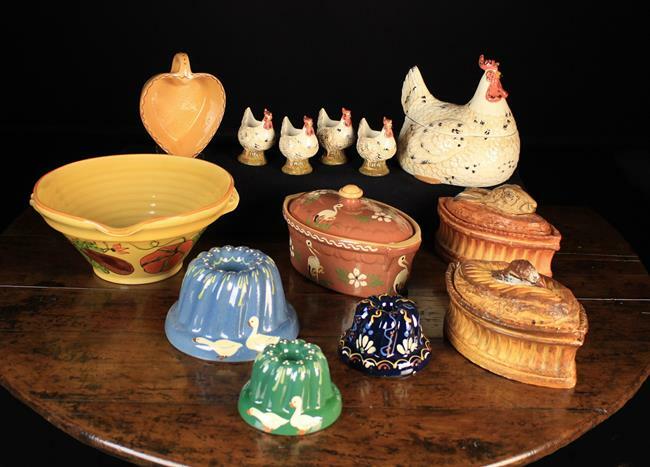 A group of modern slip-ware; a tureen, three bundt moulds, & a mixing bowl. A ceramic chicken pot and four matching chicken egg-cups. 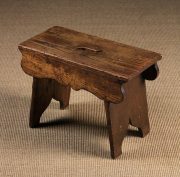 A Boarded Oak Stool. The plank seat pierced with a hand hold above serpentine frieze boards and ogee cut supporting end planks, 14 in (36 cm) high, 19½ in x 8½ in (49.5 x 21.5 cm). A Rustic Table. 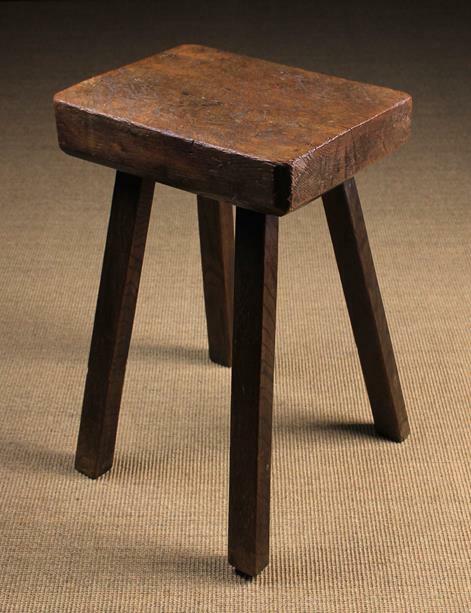 The rectangular slab top with chamfered under-edge standing on splayed block legs, 27½ in (70 xm) high, 18 in x 14 in (46 cm x 25.5 cm). 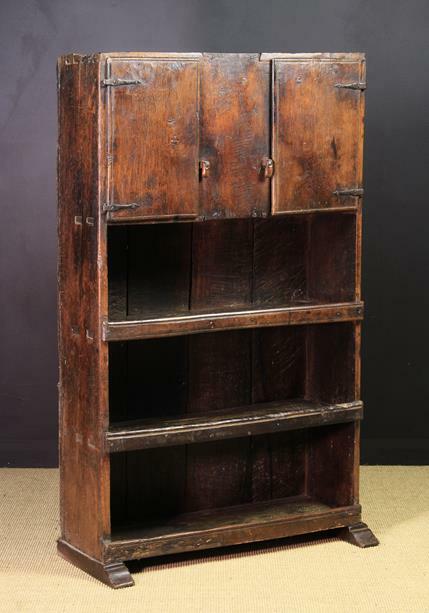 A 17th/18th Century Continental Provincial Cupboard. The plank sides and top with through dove tail joints framing a small upper cupboard with moulded plank door and slot-on pegged hinges above three open shelves with square tenons piercing the sides, and moulded rails applied to the fronts. Standing on sledge feet 58¼ in (148 cm) high, 32½ in (82 cm) wide, 12½ in (32 cm) deep. 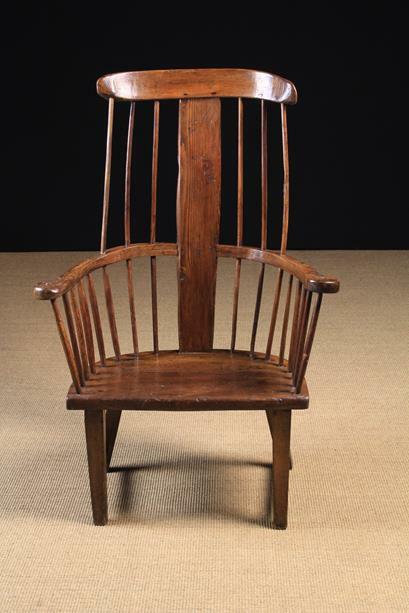 An 18th Century Rustic Pine, Ash and Elm Comb-back Armchair. The bowed top rail above a tall central pine splat flanked by long stick spindles; three either side, and eight further short spindles to the three-part arm bow leading down to a D-shaped seat pierced by rectangular tenons of rectangular legs united by side stretchers, 43¾ ins (111 cm) high, 29 ins (73.5 cm) wide. 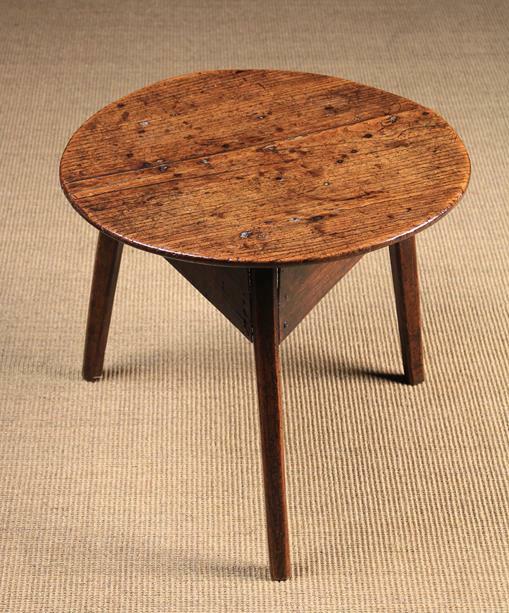 A Late 18th Century Ash Child's Cricket Table. The round top on three splayed & chamfered legs united by a boarded frieze, 18 in (46 cm) high, 20 in (51 cm) in diameter. 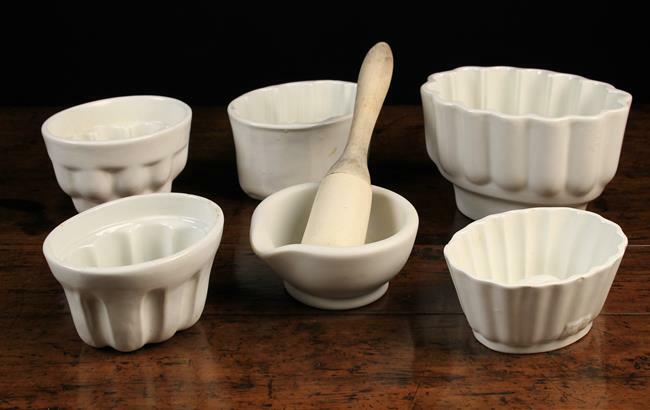 Five White Glazed Pottery Jelly Moulds & a white ceramic pestle & mortar; the pestle with turned wooden handle. 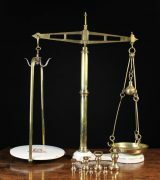 A Pair of 19th Century French Brass Weighing Scales and a set of seven Imperial brass bell weights ranging from 2lb to ½ oz . 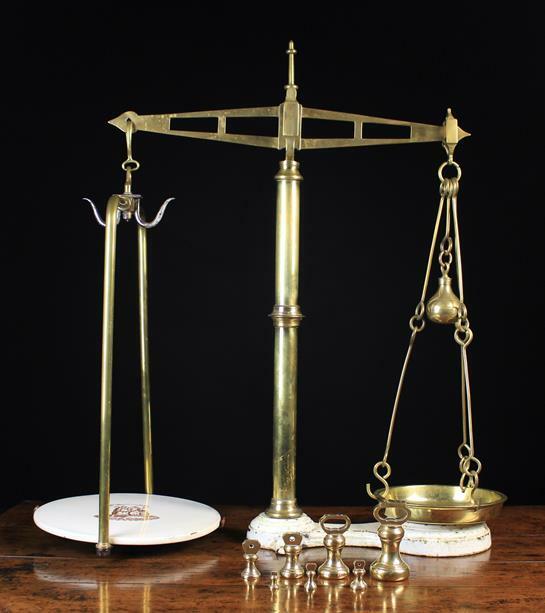 The scales having a suspended brass pan to one side and round ceramic plate to the other transfer printed with 'Justitia et Fides', on a painted cast iron base 32 in (82 cm) in height. 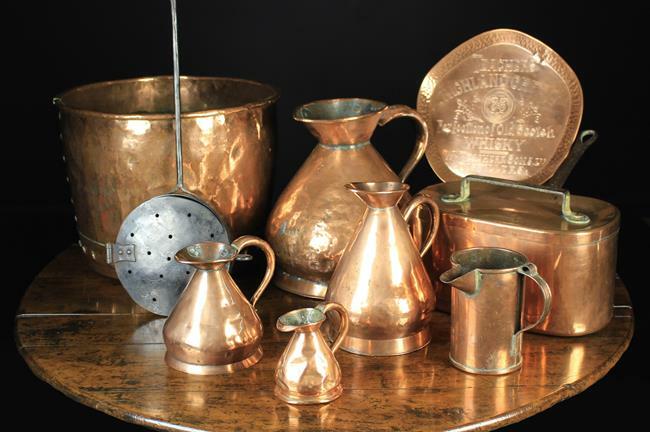 A Collection of 19th Century & Later Copper-ware: Four graduated measuring jugs ranging from 2 gallon to ½ pint, one stamped Swan & Neil Edinb. An oval copper pan with iron handle to lid and side . A large riveted copper log tub, 12½ in (32 cm) high, 16½ in (42 cm) in diameter. A cylindrical vessel with side handle and spout, 6¼ in (15.5 cm) high. A 20th century copper tray advertising Teachers Whisky. Also a sheet metal ember pan on a long wrought iron handles with hook end.